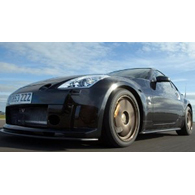 (autoinsidernews) - Nissan has confirmed that it will build the 350Z GT-S as a limited production vehicle, according to U.K.'s AutoExpress magazine. The 350Z GT-S was first unveiled in June as a concept at Goodwood Festival of Speed, but Nissan hinted that the concept could see production. The 350Z GT-S is equipped with a supercharger to bring output to 382-hp from the regular 300-hp and 313 lb.-ft. of torque, with results in a 0 to 60 mph sprint taking just 4.8 seconds, down from the standard 5.8 seconds. While we don't know why anyone would want to use it, the supercharger will reportedly have an on/off switch, reports Trend. The Nissan 350Z GT-S will be available at a reported price of ВЈ36,000 when the car goes on sale later this year. There are no plans for Nissan to offer the car in North America.